Why a "field guide?" Simply put, because there was a lot to like about Marvel Comics in the 1960s, when everything about the company seemed new and anything was possible. But all that was almost a half century ago and Spider-Man, Hulk and their costumed cohorts have been with some of us since before we were born. By now, everyone knows all about them, they've become the latest cultural icons and have proven their staying power in movies, books, computer games, even theme parks. What need to go back to pre-historic times to find out more about them? The short answer is that most people don't know all about them, the company that spawned them and especially the creative minds of the editors, writers, and artists that invented them.Today, more than ever, with tens of thousands of people becoming newly interested in the universe of Marvel heroes, an easy to use handbook or "field guide" to their origins is indispensable. That's the reason this book was written, to provide a handy, easy to use and especially, fun reference volume for anyone, whether youngsters whose only familiarity with the characters is from movies or the latest comics or those young at heart who'd simply like to reacquaint themselves after many years with old friends. Designed for the casual browser as well as those already familiar with its subject, the book can be read from the beginning or opened at any page for quick reference. What allows such versatility is the book's unique format which includes a text divided into easily digestible, quick to read "capsule reviews" of hundreds of the most important (and a few not so important) individual issues of Marvel Comics from the 1960s. These capsule commentaries not only provide brief but succinct roundups of the action and significance of the comics discussed, but also who wrote and drew them, where the creators received their inspiration, what their backgrounds were and where it all fits in to the pop culture scene of the times. And what kind of a book would it be if it didn’t also feature the art that Marvel’s artists were famous for? Lavishly illustrated,Marvel in the 1960s has been officially approved by Marvel Entertainment and features page after page of cover illustrations, original page art, uninked pages, rejected and alternative covers and pages, sketches, character designs, photos of the creators, and much more! Here, the reader will be introduced to pop-culture guru and mastermind of Marvel Comics, Stan Lee; the pulse-pounding art of action king, Jack Kirby; the inscrutable master of psychological and angst ridden art, Steve Ditko; the cool master of psychedelia and fast track pop-art Jim Steranko; the free form near photographic realism of Gene Colan; Lee's heir apparent and second editor of the Marvel line of books Roy Thomas; the pre-Raphaelite beauty of artist Barry Smith; and many others including artists Neal Adams, John Buscema, Gil Kane, Tom Palmer, Dan Adkins, Wally Wood, John Romita, Don Heck and writers Larry Leiber and Archie Goodwin. This first of a projected two volume set, Marvel in the 1960scovers three of the four phases of Marvel’s development: the Early Years, the Years of Consolidation, and the Grandiose Years roughly from 1961 to 1969. Volume two will cover the Twilight Years from 1970 to 1975. After being relegated to the realm of children’s literature, (and the low end of children’s literature at that) for the first 25 years of its history, the comic book industry experienced an unexpected flowering in the early 1960s. A celebration of that emergence,Marvel Comics in the 1960s: An Issue by Issue Field Guide to a Pop-Culture Phenomenon presents a step by step look at how a company that had always possessed the reputation of being slightly shady and one of the least creative in a generally moribund industry, emerged as one of the most dynamic, slightly irreverent and downright original contributions to an era when pop-culture, from Tom Wolf to Andy Warhol, emerged as the dominant force in the artistic life of America. Marvel Comics in the 1960s takes the reader from the legendary company’s first fumbling beginnings as helmed by savvy editor/writer Stan Lee to the full maturity of its wild, colorful, offbeat grandiosity. 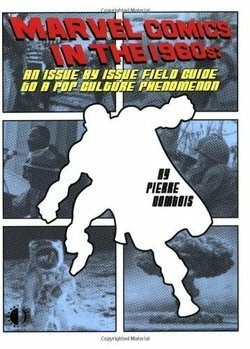 With the history of Marvel Comics in the 1960’s divided into three distinct phases, the author explains just how Lee, Kirby, Ditko, et al created a line of comic books that, while grounded in the traditional elements of panel to panel storytelling invented early in the twentieth century, broke through the juvenile mind-set of a low brow industry and provided the most vibrantly creative, tumultuous, decade of the twentieth century with a tapestry of full blown pop-culture icons!